One of my favorite cookbooks is Heirloom Baking with the Brass Sisters. More than 100 years of recipes discovered from family cookbooks, journals and scraps of paper. It's a fantastic book that is not only full of beautiful photography and scrumptious recipes, but it's full of stories and memories and recipes handed down from generation to generation. It includes 150 "found" dessert recipes from the 1800's to the 1980's. I can't say enough about this wonderful cookbook and the delicious recipes in it. If Santa doesn't bring it to you...then you'll just have to go out and get it for yourself. Along with all the other sweets I'm making for Christmas, I always have to have something chocolaty. Now remember I am not the only chocoholic in the house. I gave birth to a child who is as fierce a chocolate lover as I am. Evan will pick and sample some of the dessert I have made, but he will devour brownies when I make them. So for Evan, a child after my own chocolate covered heart I give you Brown Sugar Brownies. 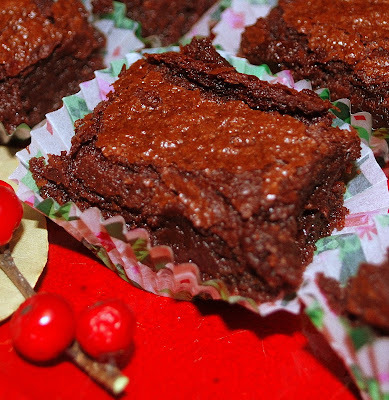 These are not cake-like brownies. They are intense, moist, fudge-like bites of deep rich chocolate. I turned these into "bites" by cutting them into small pieces and placing them in mini paper liners. Set the oven rack in the middle position. Heat to 350. Cover the bottom of a 9x13 pan with foil, shiny side up. Coat with butter or spray. Sift together the cake flour, salt and cocoa. Melt the butter and chocolates in a large metal bowl set over a saucepan of slightly simmering water, stirring occasionally until smooth. Remove the bowl from the pan and sift in the sugar, and brown sugar. Whisk to combine. Blend in the eggs one at at time. Stir sifted dry ingredients into batter. Add the vanilla. This was one thick batter. My arms got so tired that I recruited my husband in as a backup stirrer. Now I know why bakers have big biceps. Pour the batter into the pan. Bake approximately 40 minutes or until the ops seems firm and a tester inserted into the middle comes out fairly clean. There may be a few cracks on top. Mine cooked for 45 mins. Do not overbake. Cool in a pan on a rack to room temp then place into the fridge for 3 hours or overnight to chill for easier cutting. Remove cake from the pan and foil and place on cutting board. Using a wide knife or cleaver, cut into 1 inch squares, wiping knife or cleaver as needed. You will lose the edges of these brownies. Fear not, jut pop them into a freezer bag and save them to fold into your ice cream another time. Store in layers between sheets of wax paper in a covered tin. Those look delicious and the brown sugar is like a bonus...wow...in love here. I just recently found your blog, but I am wowed by your photographs and love the recipes you share! Thank your from one foodie to another. Good morning Lisa. 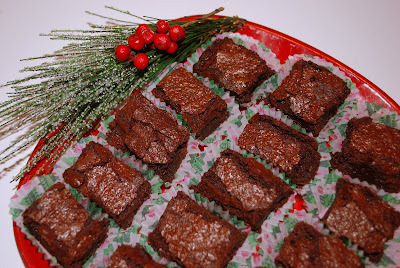 These brownies look heavenly....I love how you put them in the little papers. This cookbook sounds like one I will definitely need to have. I just noticed your 5 minute fudge..I'm adding that to my list of things to make today...I have all the ingredients :). I wanted to wish you and yours a most JOYOUS HOLIDAY full of love, family, friends, kindness, peace, health, joy and happiness. I have an 11 yr old daughter who loves brownies! She'll be happy when I make these, thanks! Couldn't it have waited one more day? Super Easy Coconut Custard Pie and a few flakes. Fast, easy, five minute fudge! Busiest week of the year.